Needles and Hooks and Books, Oh My! : A finished hat! 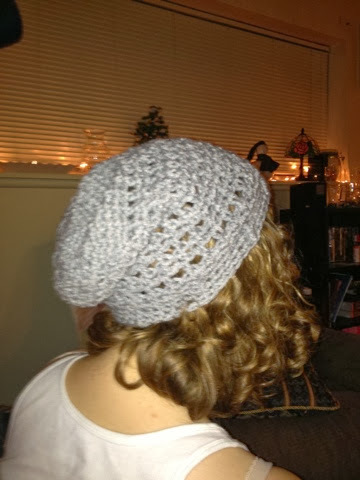 The focus isn't great, because iPhone photos are not the best at night, but I have finished a slouch hat. Challenged by my sister, I came up with the pattern myself. I plan on making more of these, so there will definitely be more (& better) pics in the future! The fact that I've been able to finish this is most certainly an accomplishment, as I have been so busy with teaching, my time is not always my own. I still want to make a few more before my final craft show of the season- next weekend! I think with Christmas being so close, many people will be shopping for gifts, and these have been particularly popular. Linking up with Tamis Amis! It's hard to get decent photographs these days. I go out of the house in the dark and come back in the dark. If I am home for once, it's mostly foggy. :-) The hat looks good anyway.